Inductive sensing is shaping up to be the next big thing for touch technology. It’s suited for applications involving metal-over-touch situations in automotive, industrial and other similar systems. 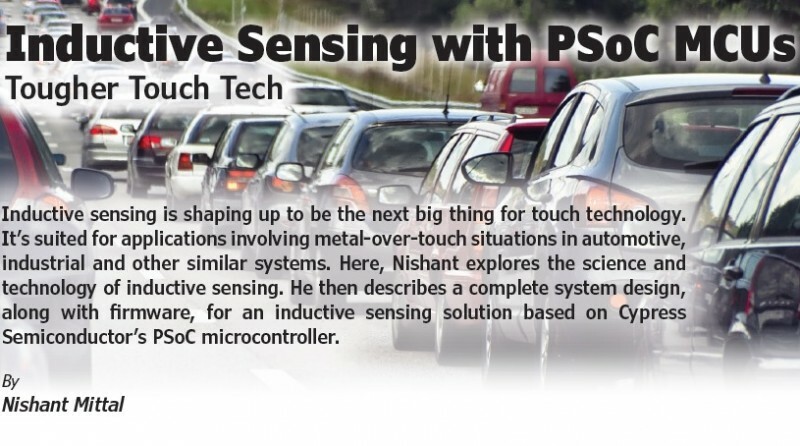 Here, Nishant explores the science and technology of inductive sensing. He then describes a complete system design, along with firmware, for an inductive sensing solution based on Cypress Semiconductor’s PSoC microcontroller. Touch sensing has become an important technology across a wide range of embedded systems. Touch sensing was first implemented using resistive sensing technology. However, resistive sensing had several disadvantages, including low sensitivity, false triggering and shorter operating life that discouraged its use and led to its eventual downfall in the market. Today whenever people talk about touch sensing, they are usually referring to capacitive sensing. Capacitive sensing has proven to be robust not only in a normal environmental use cases but, because of its water-resistant capabilities, also underwater. As with any technology, capacitive sensing comes with a new set of disadvantages. These disadvantages tend to more application-specific. And those have opened the door for the advent of inductive sensing technology. Inductive sensing technique (Source: Cypress Semiconductor application note AN219207 – Inductive Sensing Design Guide). Inductive sensing is based on the principle of electromagnetic coupling, between a coil and the target. When a metal target comes closer to the coil, its magnetic field is obstructed and it passes through the metal target before coupling to its origin (Figure 1). This phenomenon causes some energy to get transferred to the metal target named as eddy current that causes a circular magnetic field. That eddy current induces a reverse magnetic field, and that in turn leads to a reduction in inductance. To cause the resonant frequency to occur, a capacitor is added in parallel to the coil to create the LC tank circuit. As the inductance starts reducing, the frequency shifts upward changing the amplitude throughout. 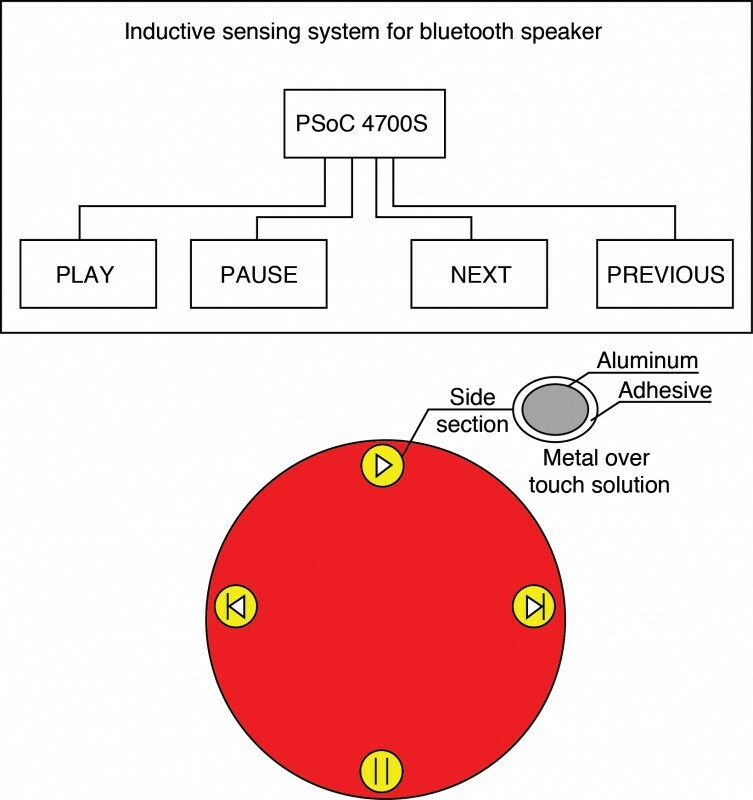 Shown here is the architecture of a water-resistant Bluetooth speaker using inductive sensing. Consider the use case of a Bluetooth speaker that needs to be water resistant and is intended for use in up to 2″ of water for half an hour. This use case requires that the product is functional underwater. It also requires that the user can adjust the speaker in these circumstances. Such operation needs to be simple, consistent and reliable—even in the presence of water. Inductive sensing provides the solution for this. That’s because it has nothing much to do with the change in dielectric, but is only concerned with the metal detection. For this application, metal-over-touch using inductive sensing would provide a consistent and reliable user performance (Figure 2). A light defection in metal can be detected as touch. Alternatively, a mechanical button and/or dial could be used. However, a mechanical interface is costly compared to a coil printed on a PCB and connected to a few passive components. Additionally, a mechanical button can break or fail, providing a much shorter useable lifespan than an inductive button would. 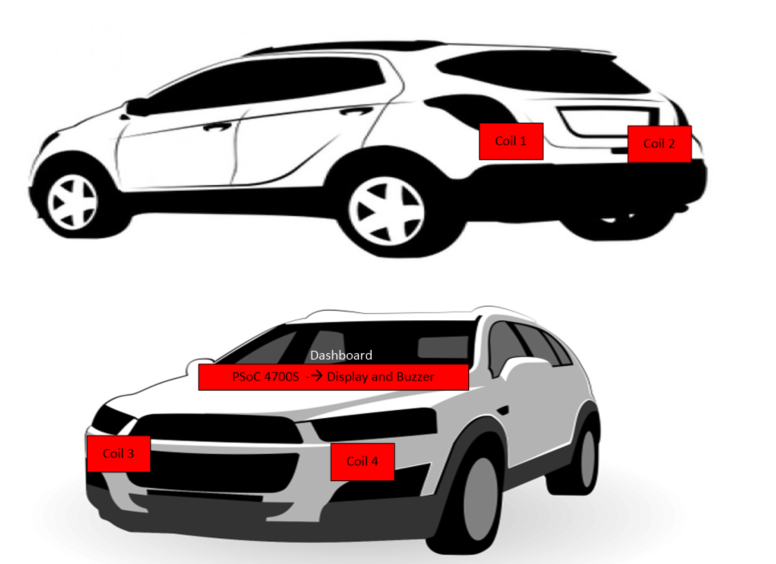 Using inductive sensing to determine vehicle proximity in an automotive application. A new family of single-chip maXTouch touchscreen controllers from Microchip Technology is designed to address a number of issues particular to automotive screens up to 20 inches in size. Even as touchscreen displays in the car grow larger, drivers expect screens to operate with the same touch experience as mobile phones. However, screens in automobiles need to meet stringent head impact and vibration tests, and consequently have thicker cover lenses that potentially impact the touch interface performance. As screens get larger, they are also more likely to interfere with other frequencies such as AM radio and car access systems. All of these factors become a major challenge in the design of modern automotive capacitive touch systems. The MXT2912TD-A, with nearly 3,000 touch sensing nodes, and MXT2113TD-A, supporting more than 2,000 nodes, bring consumers the touchscreen user experience they expect in vehicles. These new devices build upon Microchip’s existing maXTouch touchscreen technology that is widely adopted by manufacturers worldwide. Microchip’s latest solutions offer superior signal-to-noise capability to address the requirements of thick lenses, even supporting multiple finger touches through thick gloves and in the presence of moisture. As automakers use screens to replace mechanical switches on the dash for sleeker interior designs, safe and reliable operation becomes even more critical. 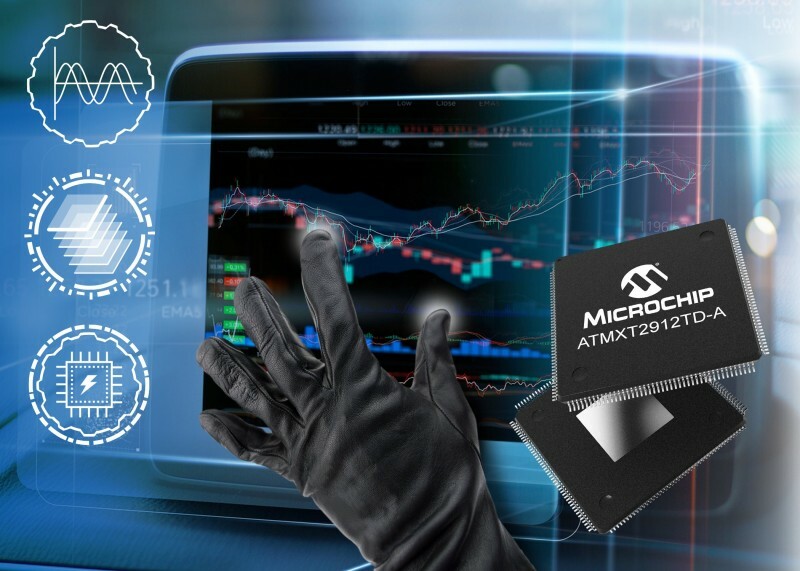 The MXT2912TD and MXT2113TD devices incorporate self- and sensor-diagnostic functions, which constantly monitor the integrity of the touch system. These smart diagnostic features support the Automotive Safety Integrity Level (ASIL) classification index as defined by the ISO 26262 Functional Safety Specification for Passenger Vehicles. The new devices feature technology that enables adaptive touch utilizing self-capacitance and mutual-capacitance measurements, so all touches are recognized and false touch detections are avoided. They also feature Microchip’s proprietary new signal shaping technology that significantly lowers emissions to help large touchscreens using maXTouch controllers meet CISPR-25 Level 5 requirements for electromagnetic interference in automobiles. The new touch controllers also meet automotive temperature grade 3 (-40°C to +85°C) and grade 2 (-40°C to +105°C) operating ranges and are AEC-Q100 qualified. With the addition of the new maXTouch touchscreen controllers, Microchip provides full scalability to customers, offering the industry’s only complete and growing portfolio of automotive-qualified touchscreen controllers for the use of various screen sizes. Developers can design multiple platforms from small touchpads to large displays in the same development environment with the same host software interface and quality user experience. This ultimately shortens design time while lowering system and development costs. Eight dedicated application and sensor design centers around the world help Microchip customers and partners accelerate the process of bringing their maXTouch technology designs to market. Microchip’s maXTouch technology specialists are working with all major sensor, display and touch module manufacturers. An evaluation kit is available for each of the parts in the new maXTouch touchscreen controller family. The kit includes a Printed Circuit Board (PCB) with the maXTouch touchscreen controller, a touch sensor on a clear glass lens, the Flat Printed Circuit (FPC) to connect to the sensor display, a converter PCB to connect the kit to the host computer via USB, as well as cables, software and documentation. All parts are also compatible with maXTouch Studio, a full software development environment to support the evaluation of maXTouch touchscreen controllers. The MXT2912TD-A and MXT2113TD-A devices are available now in sampling and volume quantities in LQFP176 and LQFP144 packages, respectively.